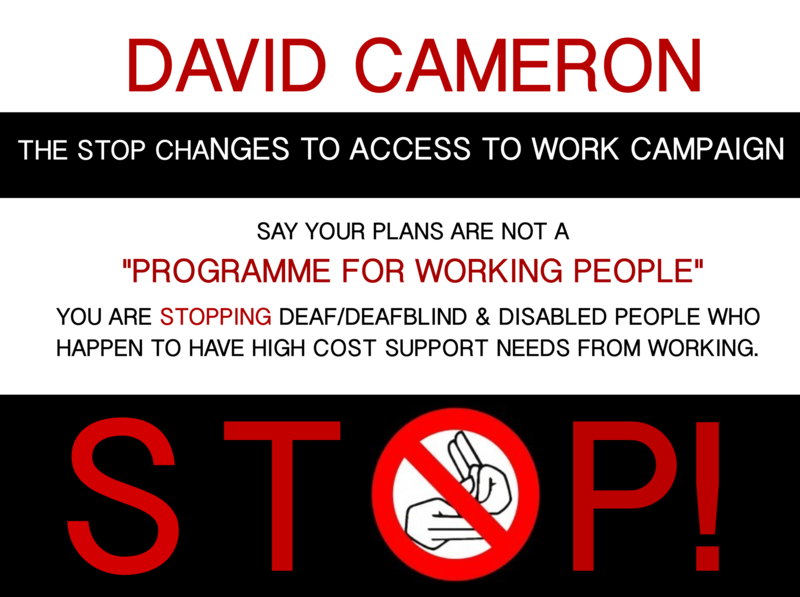 TUC Disabled Workers’ Conference – Motions in support of Stop Changes. The recent TUC Disabled Members’ Conference saw two motions being submitted that support the work we are doing at Stop Changes. It was a great opportunity to ensure that the issues around Access to Work are raised within union branches and that the profile and reach of the campaign is widened. We will be working hard to improve our links to others who are also campaigning on this issue. Please continue to share and support our petition and wider campaign. Thank you. UPDATE: DWP to stop using new interpretation of “additionality”. Stop Changes recently raised the issue of additionality with the DWP as we were made aware of a new interpretation of guidance which had led to applications being refused. · Recently, some, predominantly Deaf, Access to Work customers have experienced reductions to their awards following more consistent interpretation of existing guidance around the additional cost relating to the disability need within the work place. · DWP will amend guidance to set out more clearly how the policy intent of ensuring equality of access between disabled and non-disabled people in the work place applies in these circumstances. · Any customers who wish to challenge a decision where this has been applied, including those who may have already received a reconsideration, may have their claim looked at afresh based on the long-standing interpretation of the guidance. Stuart Edwards went on to say, “we should identify and work through all the affected cases in the next week or do, but encourage those who have had an application turned down on the “extra costs” basis to get in touch with us”. Once again, we would like to thank Stuart Edwards for contacting us and sharing this information. We would urge anyone affected by this to get in touch with Access to Work and ask for a reconsideration or, if already reconsidered, that the claim is looked at again in light of this information. Please get in touch with us at StopChanges (emilysmith2007@mail.com) or alternatively contact DeafAtW if you need any support with this. 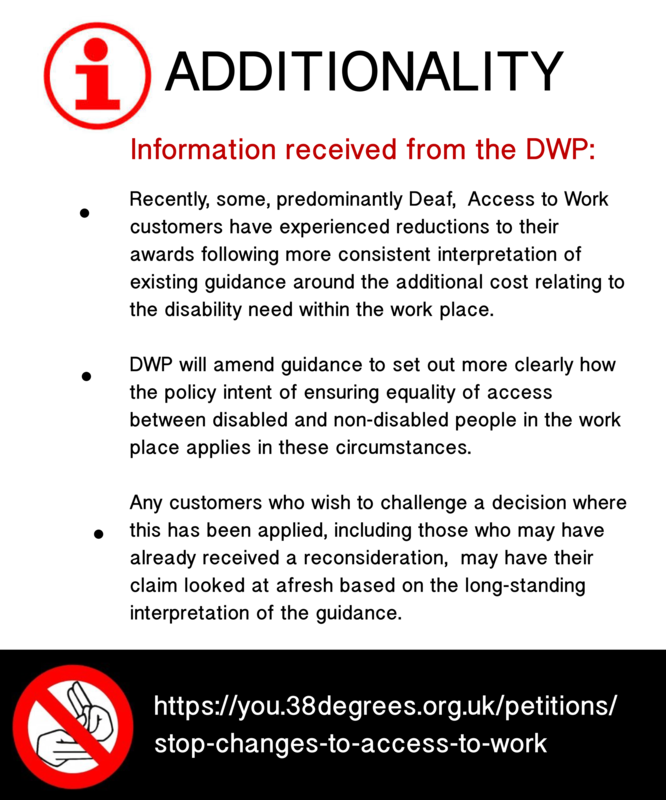 StopChanges will be asking how this new information received will be clarified in guidance as in the recent Equality Impact Analysis, Additionality, is stated as one of the core principles of Access to Work. Our reaction to David Cameron’s speech at the opening of parliament. “My government will legislate in the interests of everyone in the country. It will adopt a one nation approach, giving new opportunities to the disadvantaged and bring in different parts of our country together”. He describes his agenda as being for “working people”. We know that this isn’t the case. Over the past five years people have seen changes to their employment support provided through the Access to Work scheme which have placed their jobs at risk. People have faced demotion or expulsion as they could no longer complete their jobs to a satisfactory level when their support was either cut or removed. Following on from the suspension of the 30 hour rules, the Work & Pension Select Committee inquiry and the attempted judicial reviews by human rights law firm Leigh Day (http://www.leighday.co.uk/News/2014/December-2014/Legal-action-over-Access-to-Work-scheme) we saw a temporary improvement. However things are set to get worse again. The discriminatory caps outlined in the Equality Impact Analysis (https://www.gov.uk/government/uploads/system/uploads/attachment_data/file/426416/future-of-access-to-work-equality-analysis.pdf) will come into force in October this year meaning many people will once again have difficulty meeting their work demands. The Stop Changes To Access To Work campaign will continue to fight to defend our right to work, regardless of support needs. 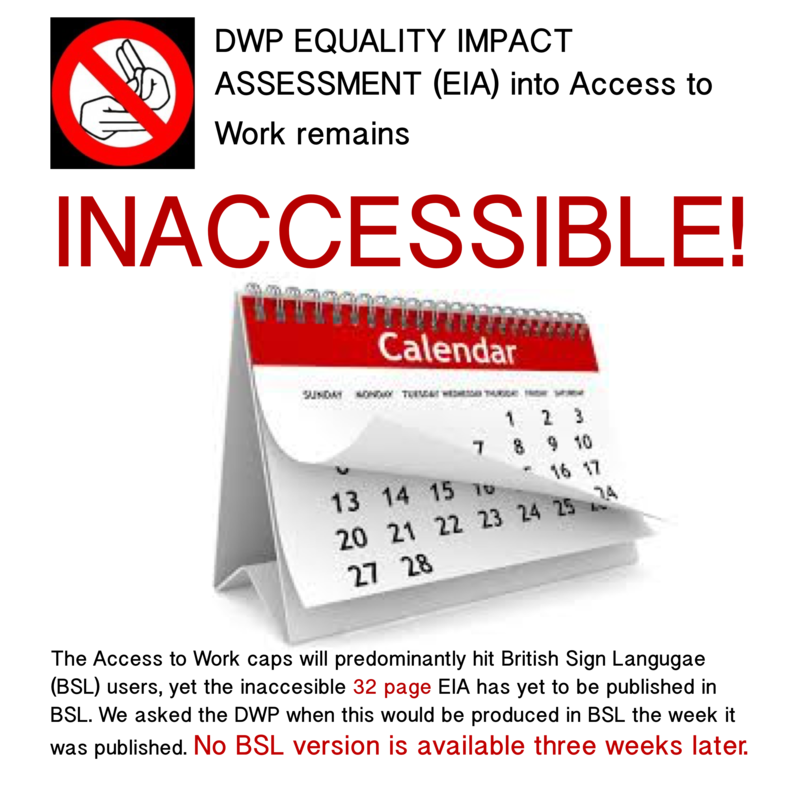 Equality Impact Assessment is inaccessible! The Equality Impact Assessment which was sent out by the DWP on the 8th May (though published four days prior to this) has not been produced in an accessible version for BSL users. It details the changes to the scheme and how this is expected to effect individuals. These changes will see Deaf BSL users having their support capped, while also affecting others who happen to have high cost support needs, yet the information has not been made available to those it will effect the most. BSL users are consistently the last group to receive any information. Information should not be sent out until all accessible versions are available, this includes BSL. This example sums up many peoples experience of Access to Work. Jenny Sealey’s reaction to the election: A call to come together. Jenny reminds us of the importance of standing together during this time. Things are going to get very tough, and we ask everyone to please look after each other. The support and encouragement we can give to one another is vital. We’d urge you all to join a union, campaign, and get involved. Thank You! Please keep sharing and signing. New petitions on Access To Work. The Independent published their piece on Access to Work on the 8th May, soon after the release of the DWP publication about its new plans for AtW. The publication and its release at the same time the new Government was elected caused widespread anxiety, creating at least two new petitions being set up. Those petitions are about AtW, asking the Government to reconsider in the current economic and employment climate. As you know we have been campaigning on this issue since it began in November 2013. We are delighted that other people are interested in campaigning about the problems with Access to Work. We are attempting to contact the people who have set up these new petitions to see if and how we can work together to achieve the maximum impact. Stop Changes To Access To Work are eagerly awaiting the announcement of the new Minister for Disabled People, and shadow ministers, so we can resume our essential campaign work. A picture tells a thousand words! 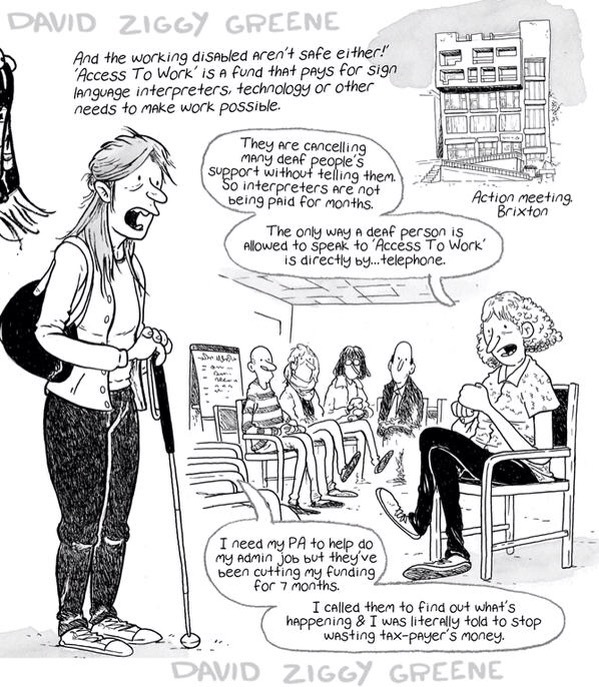 The wonderful David Ziggy Greene (Scene & Heard) who works for Private Eye, has kindly given permisson for us to share this piece he did on Access to Work. Hopefully it will make it easier to share this rather than try to explain the scheme to people who are unfamiliar with what it is. Please share this video! We need to raise awareness. Access to Work: the scheme that brings in money. Within hours of the Tory government winning the election, cuts to the Access to Work scheme, are reported in the Independent: Read article here. This came as no surprise as we were aware of the governments intentions to cut the scheme when they refused to respond fully to the Work & Pensions Select Committee inquiry report in the lead up to the general election. The then Chair of the committee, Dame Anne Begg, wrote to the then Minister for Disabled people, Mark Harper, with regards to this issue to express the committees concern over the apparent dismissal of their findings. See the letters here. The government have now issued their equality analysis, which whilst mentioning many of the issues raised in the injury, deals with none of them. The government continues to state that there isn’t any money for the scheme. They have yet to disprove that Access to Work brings money into the treasury or publish any information or financial analysis. In Freedom of Information request responses received, it is confirmed that this information is held. We will continue to push for it’s release. The overall DWP budget is around £5.2 billion. Access to Work as a percentage is not only insignificant, but ALL the money is recouped, yet still this government persist in stating that there is not adequate funding available.